The London Sea Shanty Collective were commissioned by the British Library’s Printed Heritage Department as part of a project to revive songs from the historical collections. As part of our concert at the British Library, we sang two songs from their archives – Billy Taylor and An Invitation to Lubberland, a 17th-century Roxburghe Ballad. It sits in a subversive tradition ranging back to the 13th-century Land of Cockagne and forward to the Big Rock Candy Mountain. Part of a project building up to the 400th anniversary of the Mayflower’s departure for the “New World”. 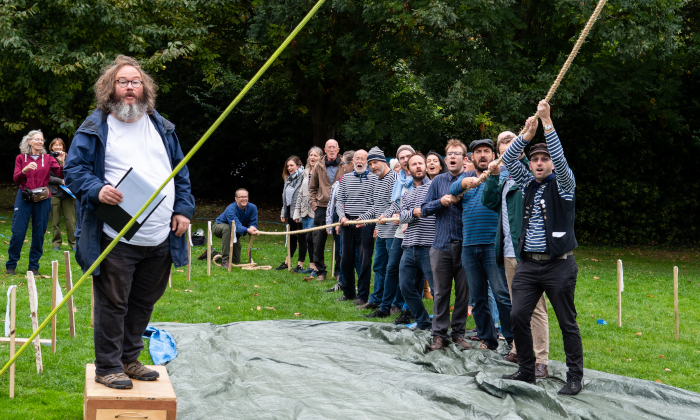 We sang ballads and shanties as Bubble Theatre and members of the public brought the ship and its passengers and crew to life in a park in Rotherhithe, south London.